A tweet by filmmaker Shirish Kunder is making Twitter laugh. Delhi Lieutenant Governor Anil Baijal has been working from home since Monday ever since Chief Minister Arvind Kejriwal and three of his ministers sat on a sit-in protest at the Lt Governor's office. Sources say that the Lt Governor or LG is going through files related to the Delhi Police, Delhi Development Authority and other departments at his residence, but he did not receive any Delhi government files as the chief minister and three other AAP ministers have been protesting. Amidst all this, a tweet by filmmaker Shirish Kunder, which has now been deleted, is making Twitter laugh out loud. 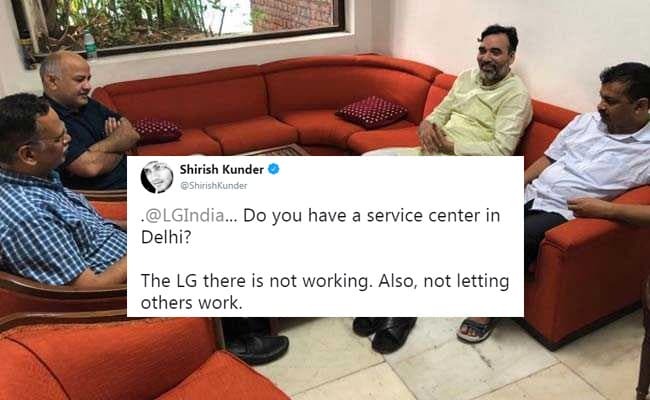 The director, who often tweets his humorous takes on topical issues, took to the micro blogging website about four hours ago to ask LG Electronics if they have a service centre in Delhi, since "the LG there is not working." The tweet has now been deleted. .@LGIndia... Do you have a service center in Delhi? And though Mr Kunder's tweet was meant to be a lighthearted one, LG Electronics took it in complete sincerity and immediately responded to tell him that they would assist him shortly. In a tweet which was deleted soon after, LG Electronics wrote "We regret the inconvenience caused. Please DM us your contact details so that we can assist you shortly." We regret the inconvenience caused. Please DM us your contact details so that we can assist you shortly. Ha ha this one is one of the best.. So very miraculously hilarious.. Thanks for keeping the Twitter posts live.. The AAP leaders have been trying to meet Mr Baijal since Monday evening to discuss two demands - one, that he step in to end what Mr Kejriwal alleges is a boycott by officials, and the second, a go-ahead for a doorstep delivery scheme that was nixed by the Lieutenant Governor.